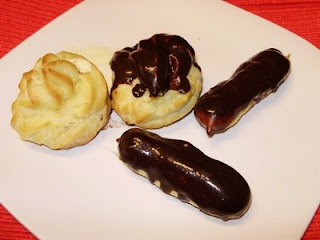 Memoirs from My Kitchen..: Eclairs, how exciting.. The August daring bakers challenge was Éclairs by Pierre Hermé. I was so excited, I haven't had an eclair in ages, and haven't made them since I was in college.. so I was really really excited to 'get this show on the road". I had a few setbacks though.. my pastry tips seem to have walked away or something because I only had 2, a very small round and a star tip.. crap, Okay, I'll be the first to admit they came out less than perfect.. I blame my too small pastry tip for this one though, because they tasted really good.. when I finally got the right size pastry tip though.. I had no camera, so I'm stuck with this one picture that got salvaged from the others that got deleted when I removed all the software from the Olympus..
Add the cornstarch and whisk vigorously until no lumps remain. great layout and with a 3rd column.....great idea for a blog. 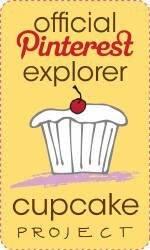 My friend is a total foodie and I keep asking her to start a blog.....I will show her yours for inspiration. She might pull her finger out and get on with it. 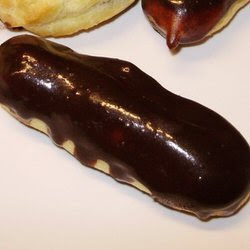 Beautiful eclairs! I'm trying your brownie recipe today. I also had to go hunting for my tips! They were right where I left them; waaaaayyyyyy back in the corner of the pantry. :) Your eclairs are adorable. Great job!